State of IL, license verification - Dennis D. Christensen, MD (search by name) State of WI, license verification - Dennis D. Christensen, MD (search by name) Former abortionist at: Affiliated Medical Services Abortionist shows off abortion skills, views deceased fetus "Opinion and Order" (August 2013), Planned Parenthood v. Van Hollen - Dr. Dennis Christensen co-owns abortion clinic, has committed abortions for almost 40 years. See page 13. An Abortion Doctor's View -- The New York Times, 1-20-2003 Abortionist denied hospital privileges in Wisconsin after Illinois clinic shut down -- LifeSite News, 1-24-2014 Judge tells abortionist: quit trying to break the law and put women's lives at risk -- LifeNews, 5-30-2014 Wisconsin abortionist wants to retire, but can find no one to take his place -- Live Action News, 7-7-2014 Abortion doc who "removes the pregnancy" sees killing babies as a "calling" -- Life Dynamics, 4-4-2015 Formerly worked at: Northern IL Women's Center in Rockford, IL (now closed) As of November 2016, Dr. Christensen reportedly no longer worked at Affiliated Medical Services. Maureen Hall is supervised by Dennis Christensen, as noted on his license profile. Christensen supervises physician assistants Mary Laan and Maureen Hall. Michigan physician assistant application documents for Maureen A. Hall, as employee of abortionist Dennis Christensen. Second court order in response to Planned Parenthood lawsuit. 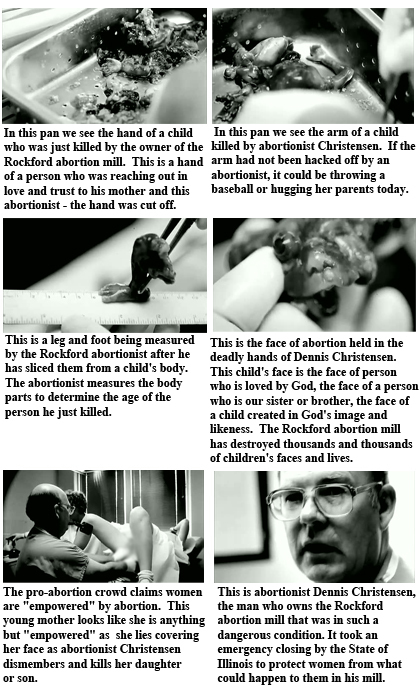 Dr. Christensen is co-owner of abortion clinic, has performed abortions for almost 40 years. See page 13. Planned Parenthood and and several Wisconsin abortionists sue the state of WI over abortion legislation. Dr. Dennis Christensen is co-owner of Affiliated Medical Services abortion clinic, and has been an abortionist for nearly 40 years. See pages 6-7.